America’s leading developers, municipalities, fleet owners, utilities, policy makers, financiers, and technology experts are meeting at US Biogas 2018 (November 5-6) to overcome the challenges associated with profitable biogas production and utilization. The latest insights delivered by CR&R, CalBio, Trillium CNG, Maas Energy Works, RNGC will help you truly monetize your biogas cycle. 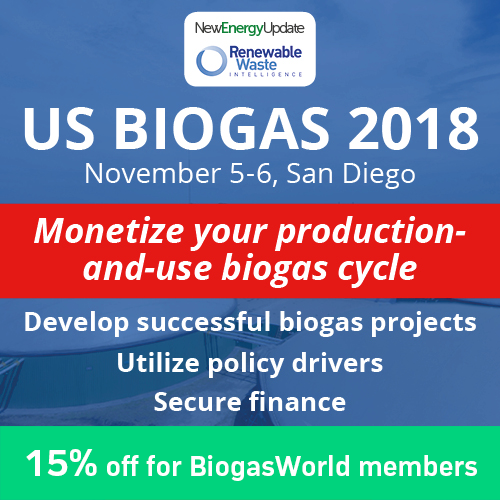 To help you capitalize on your commercial opportunities in the most lucrative markets, US Biogas 2018 (November 5-6, San Diego) will bring together more than 250 senior executives from every link of the biogas supply chain to overcome the economic, technical and public policy challenges that businesses in this industry must wrestle with. The latest insights delivered by CR&R, CalBio, Trillium CNG, Maas Energy Works, City of Petaluma and RNGC will help you truly monetize your biogas cycle.